History of recurrent dermatophytosis (ringworm) that was considered resolved over several months’ time. Three weeks before presenting to ADRC, Othello developed a single subcutaneous nodule on the right side of the haired nasal bridge near the nasal planum (non-haired portion of the nose). The affected area was not pruritic (itchy) and did not seem to bother Othello. An injection of Convenia (antibiotic) was given 8mg/kg SC and Othello was rechecked 2 weeks later by his regular veterinarian. The original nodule was slightly larger in size and another raised subcutaneous nodule was noted on the left side near the nasal planum. An antihistamine (chlorpheniramine) was then prescribed pending ADRC consult one week later. ADRC examination identified two ~0.25cm circular raised dermal to subcutaneous firm nodules on the dorsal aspect of the haired nasal bridge. According to the owner the nodules were unchanged since starting the antihistamines, and seemed to worsen after administration of the Convenia antibiotic. The two nodules were not open, draining, or ulcerated. The submandibular lymph nodes were soft to the touch, symmetrical, and considered within normal limits. No nasal or ocular discharge was present. No sneezing or coughing was noted by the owner. Wood’s lamp negative, trichogram negative, and DTM culture were negative for dermatophytosis (ring worm), and tissue fungal culture had no growth. FNA from nodules revealed TNTC red blood cells with mixed non degenerate neutrophils, one small cluster of eosinophils, and several plasma cells (inflammatory cells). No organisms were noted. Excisional biopsy reported a focally severe, predominantly plasmacytic, deep dermatitis and panniculitis/myositis. 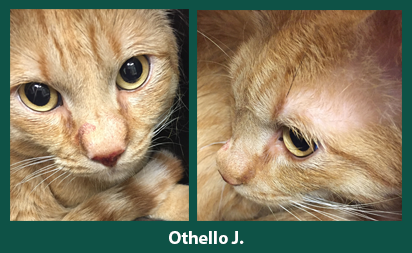 These results were consistent with the rare condition ‘Nasal Plasma Cell Dermatitis.’ Some of these cases have occurred in conjunction with ‘Plasma Cell Pododermatitis’, but there have been reports of cases with nasal involvement only like Othello’s case. In plasmacytic pododermatitis, paw pad swelling often progresses to ulceration. In nasal plasma cell dermatitis swelling followed by ulceration has been reported, but considered less common. The exact etiopathogenesis (cause) is uncertain, but it is currently believed that this may represent an immunologic process similar to plasma cell pododermatitis. Treatments recommended in the literature include glucocorticoids, surgery, and anti-inflammatory doses of doxycycline (or minocycline) at 10mg/kg a day. Prognosis is good as most reported cases respond to treatment; however, relapse is possible after discontinuation of anti-inflammatory medications. Othello has just begun anti-inflammatory doses of twice daily minocycline (5mg/kg) and we will monitor his progress over the next several months.